As negotiations are resuming on a comprehensive nuclear agreement under the Joint Plan of Action, Iran’s on-going illicit nuclear and missile procurements complicate the achievement of that agreement. Moreover, Iranian officials recently trumpeted the nuclear programs’ illicit procurements while inaccurately trying to present Iran as a victim of sabotage. Given that the Iranian government openly supports violating other governments’ trade control laws and United Nations Security Council sanctions, its complaints that some governments modify illegally acquired goods so they do not work is at best hypocritical. Iranian official statements are akin to a bank robber complaining about having stolen money destroyed by dye cartridges emplaced by a bank. Any long term agreement will need to create an architecture that prevents Iran from importing goods for banned or covert nuclear programs. Yet, Iranian procurements for its sensitive nuclear and ballistic missile programs violate national trade control laws of supplier states and United Nations Security Council sanctions on a wide range of goods. National and international laws explicitly control many specific direct use and dual-use goods sought by Iran and many other countries. These laws also contain catch-all conditions that ban the sale of a much larger group of dual-use goods to these programs and in particular to Iran’s nuclear programs. Most of these national and international controls and sanctions on proliferation sensitive goods, which are those needed in Iran’s nuclear and missile programs, are expected to continue throughout much, if not all, of the duration of a long term agreement. Unless Iran verifiably stops its illegal nuclear and nuclear-related procurements, it will severely weaken the verifiability and value of a long term nuclear agreement.3 Iran could use these black market procurement methods to gather secretly the wherewithal to build covert nuclear plants and to enable a surge in installation of nuclear facilities in case it reneges on the agreement. In late August 2013, the AEOI held expositions on the nuclear program, which included a display specifically showcasing and complaining about goods used in its nuclear facilities that were allegedly sabotaged by Western governments (see figures 1, 2, and 3). Yet, many of these goods were obtained illegally. Zarean [showed] AP journalists parts and equipment, including modems and pumps, which he said had been deliberately tampered with to sabotage Iran’s nuclear program. He described the items on display, which he said had been manufactured in Western and Asian countries, as only a small sample of Western sabotage. Because Iran’s procurement efforts are in contravention of UN Security Council sanctions and domestic trade control laws, several countries take further steps with regards to certain goods. Some governments modify the goods so that they will malfunction or fail when used by Iran. These countries believe that they are justified in taking such additional steps aimed at preventing Iran from benefiting from its ill-gotten equipment, a step which is routine when addressing a variety of criminal activities. For example, such actions are similar to the use of dye cartridges by banks to destroy stolen money. With that example in mind, Iran’s recent statements are like a bank robber complaining about having stolen money destroyed. Using public photographic evidence of the AEOI exhibitions, the London-based Project Alpha analyzed the equipment in the images, identifying by type and by Western supplier some twenty goods on display.5 One should note that Iran offered little evidence of sabotage, and thus some of the goods may be mislabeled, having instead simply broken during normal usage. Iran’s centrifuge program for example has encountered many difficulties independent of sabotage. Nonetheless, the photographic evidence and Iran’s statements about these goods show a large variety of imported dual-use goods used in Iran’s nuclear program. Many of these goods would have been acquired illegally whether or not modified prior to Iran’s procurement of them. Iran’s recent expressions of indignation appear to imply that Iran intends to maintain its illicit procurement networks and to continue demanding the right to obtain pristine equipment illegally. Although Iranian officials called for bans on the sabotage of such equipment, they offered no indication that Iran would be willing to stop its illicit procurements for its nuclear and missile programs. Iran’s statements and actions make clear the necessity of including in any comprehensive nuclear agreement provisions which limit and regulate Iran’s nuclear and nuclear dual-use procurements well into the future.6 In particular, Iran will need to commit to stop further illicit nuclear procurements. Efforts to modify or otherwise sabotage equipment Iran seeks illegally is bound to continue. Many states will likely seek to enforce domestic and international laws, by prosecuting and bringing to justice those who undertake or direct these illegal procurement activities and by taking actions that prevent Iran from benefiting from illegally acquired goods in its nuclear programs. Figure 1. 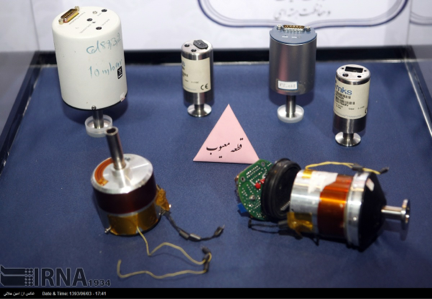 Goods on display that Iran apparently obtained via breaking sanctions and that are purported to be modified so that they would not work correctly or break when operated. Figure 2. 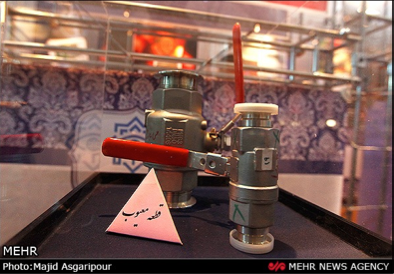 Two valves used in systems under vacuum in Iran’s exhibition of smuggled goods obtained in violation of national and international laws, purported to be modified so that they do not work. Figure 3. Image from IRNA. These objects are pressure transducers used to measure the pressure in a vacuum, such as that used in a gas centrifuge plant. 1 “Iran President Rouhani Hits Out at U.S. Sanctions,” BBC News, August 30, 2014. http://www.bbc.com/news/world-middle-east-28997452. 2 Fars News Agency, صالحی: برخی کشورهای شرقی فریب غرب را برای ایجاد خرابکاری صنعتی در ایران خورده‌اند/ ۵ سؤال آژانس در دستور کار قرار دارد, August 25, 2014. http://www.farsnews.com/newstext.php?nn=13930603000580. 3 Exemptions for legitimate nuclear activities would be expected. Such exceptions were made in existing UN Security Council sanctions resolutions for the Bushehr nuclear power reactor. 4 Nasser Karimi, “AP Interview: Iran Says it Disrupts Nuclear Plots,” Associated Press, September 2, 2014. http://bigstory.ap.org/article/ap-interview-iran-says-it-disrupts-nuclear-plots . 5 Project Alpha, Sabotage? 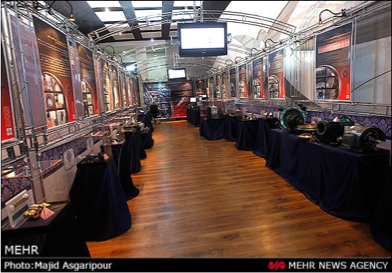 Iranian exhibition gives insights into illicit procurement methods and challenges, September 4, 2014. https://www.acsss.info/item/347-sabotage-iranian-exhibition-gives-insights-into-illicit-procurement-methods-and-challenges. 6 For more on ISIS’s recommendations on creating a negotiated structure to prevent future illicit trade, see: David Albright, Olli Heinonen, and Andrea Stricker, “Five Compromises to Avoid in a Comprehensive Agreement with Iran,” ISIS Report, June 3, 2014. See compromise 5 starting on page 18. http://isis-online.org/uploads/isis-reports/documents/Five_Bad_Compromises_3June2014-final.pdf See also Defining Iranian Nuclear Programs in a Comprehensive Solution under the Joint Plan of Action (Washington, DC: Institute for Science and International Security, January 15, 2014). http://www.isisnucleariran.org/assets/pdf/Elements_of_a_Comprehensive_Solution_20Jan2014_1.pdf.